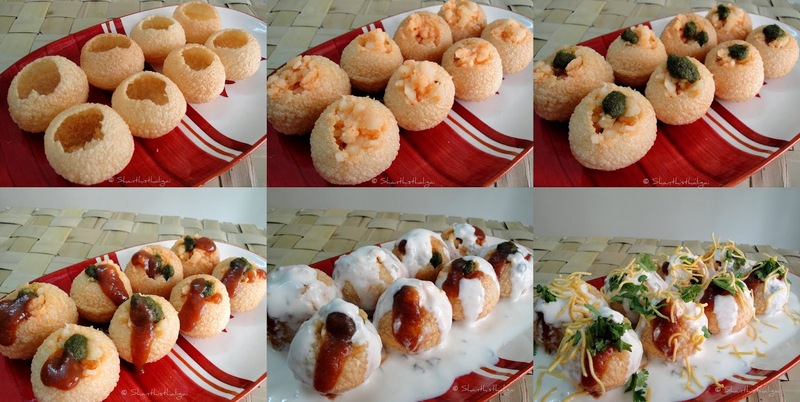 Dahi puri, a popular chat, is a healthy, cool and easy to prepare snack especially during summer. Chat masala - 1 tsp. Fry pooris. Beat curd until smooth. A pinch of sugar/salt can be added to the curd if desired. Boil potatoes, peel, add little salt and mash roughly. Take a poori, crack a hole in the centre and stuff with the potato filling. Add green chutney, sweet chutney on top of it. Pour beaten curd on it. Top it with sev and finely chopped coriander leaves. Sprinkle chat masala and red chilli powder. Serve immediately. Add more or less of any ingredients according to your tastebuds. super delicious and tempting dahi batata poori.